We talked about the future from fairly early on, not marriage and kids and mortgages in any sort of sensible grown up way, just a mutual understanding we needed to be together, and that everything would turn out all right if we had each other in our lives. When conversation did turn to children, we knew we wanted lots of you, couldn’t wait to see what would happen when our features and personalities combined (my eyesight, Luke’s ears please) and even had a favourite boy’s name long before you first appeared as a kidney bean-sized heartbeat on the ultrasound scan. Now in just over a week you’re due to make your arrival in this world and our lives are going to change all over again. I’ve imagined this moment countless times over, smelt your sweet baby skin and felt your fingers clasp mine, but at the same time we have no idea of what is yet to come. On a practical level there are pictures to be hung, blankets to be ironed and my hospital bag is only half packed, but even if we were organized to the point of perfection, I’m pretty sure you’re going to blaze on in and disrupt even the best laid plans. And I wouldn’t want it any other way. I think this is a strange time for any mother, these countdown days. There’s excitement to meet your little person, fear about the whole crazy process of birth and also the fact that your baby will no longer be safe and snuggled inside you, breathing your breaths and growing with every bite you take. For me, without being overindulgent, it’s even more terrifying: when you emerge your little body literally won’t survive unless your chest is cut open, your heart chilled down and your arteries swapped round. It’s hard to come to terms with, to even comprehend. I have to trust that a team of near strangers – albeit incredible, qualified, best in their field strangers – will fix you up in the way that I, as your lion-hearted mummy, only wish I could. So I’m worried and scared, little bean, but also giddy and sleepless and grinning from ear to ear at the prospect of finally holding you in my arms. The thought of seeing Luke be your daddy is making me well up just sitting here: I am so ridiculously excited for you to meet him. In the lottery of parents, regardless of how I measure up, with him you’ve hit the jackpot. Eleven years and I love him even more with every one – and I promise you’re going to slot right in to this little family love bundle. Enjoy your quiet time in there little man, it’s not long now until everything changes. Keep wriggling and growing and getting stronger: there are so many people just desperate to meet you and to love you as much as we already do. 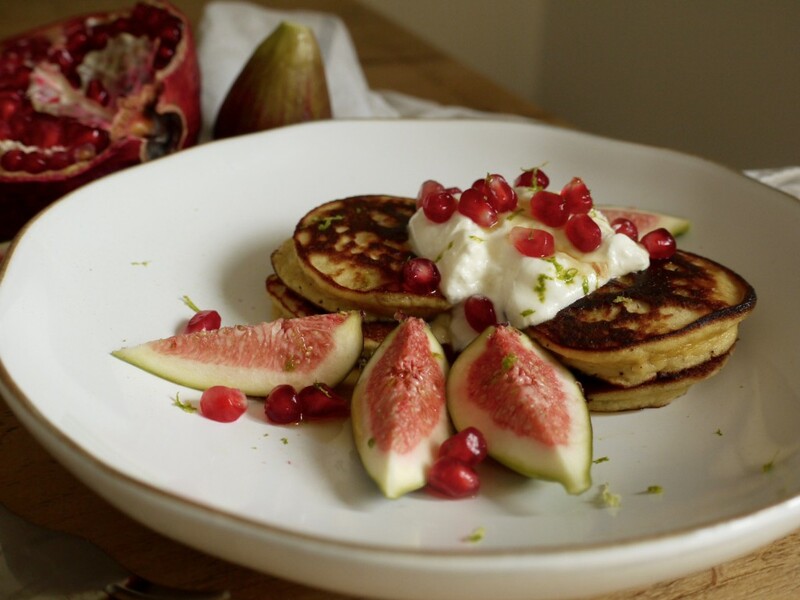 Because, for me, food and love go hand in hand, this is the recipe for my favourite pancakes at the moment. When I’m standing flipping them at the stove, my ever-growing belly is close to the pan and our baby boy responds to the heat with his own squirms and flips. 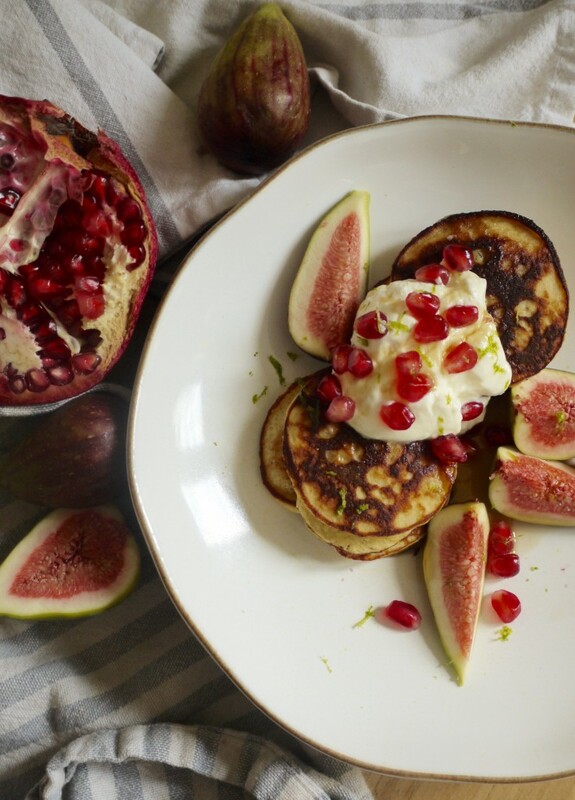 Fig and pomegranate is a gorgeous, juicy combination, but these would also be lovely with blueberries in the batter or diced mango on top. 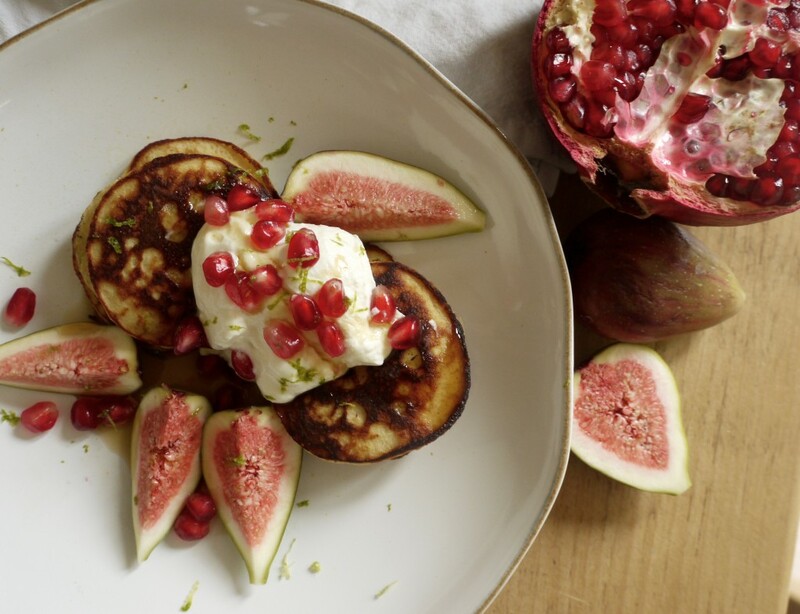 Tender, slightly sweet pancakes topped with juicy figs and pomegranate seeds. Using coconut flour means this recipe is naturally gluten free and paleo. Be careful when flipping the pancakes as the batter is fairly tender. 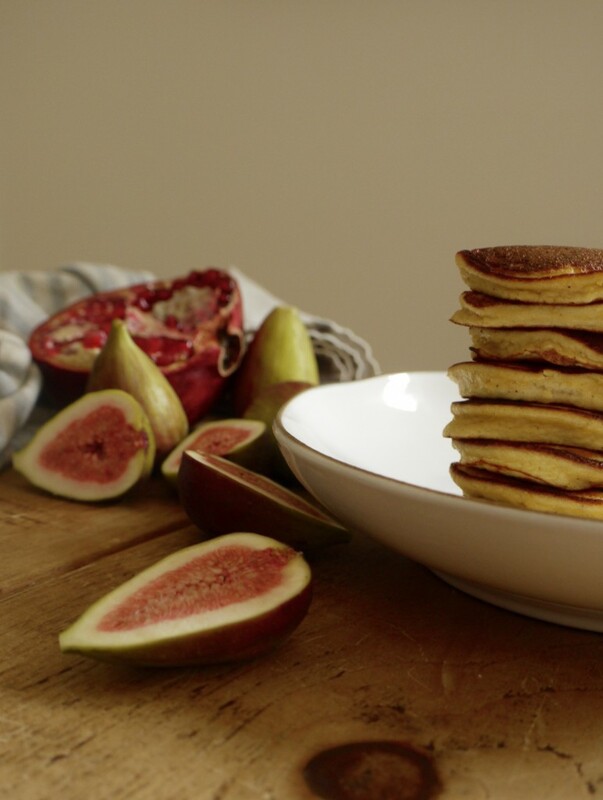 You'll get about 20 little pancakes from the mix, which makes for about four greedy servings. In a medium bowl, whisk together the coconut flour, baking powder, vanilla, cinnamon and salt. Make a well in the middle and whisk in the eggs, coconut milk an nectar until smooth. Heat a little coconut oil in a medium pan and spoon in heaped tablespoons of batter, using the back of a spatula to flatten and make sure they are spaced apart. You should be able to fit 3 - 4 pancakes in the pan at once. Cook for about 3 minutes on one side, or until bubbles begin to appear in the batter, then flip and cook for a further 1 – 2 minutes. 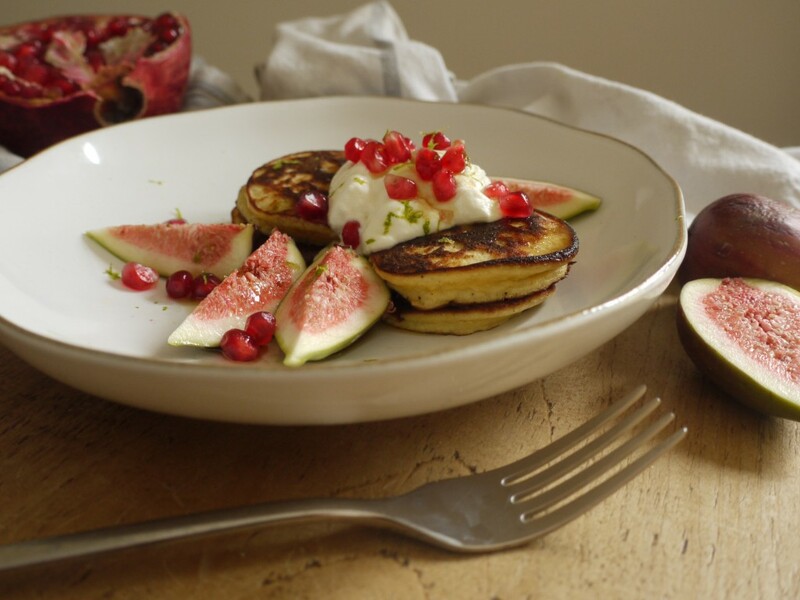 As you cook them, stack your pancakes on a plate covered with foil to keep them warm. 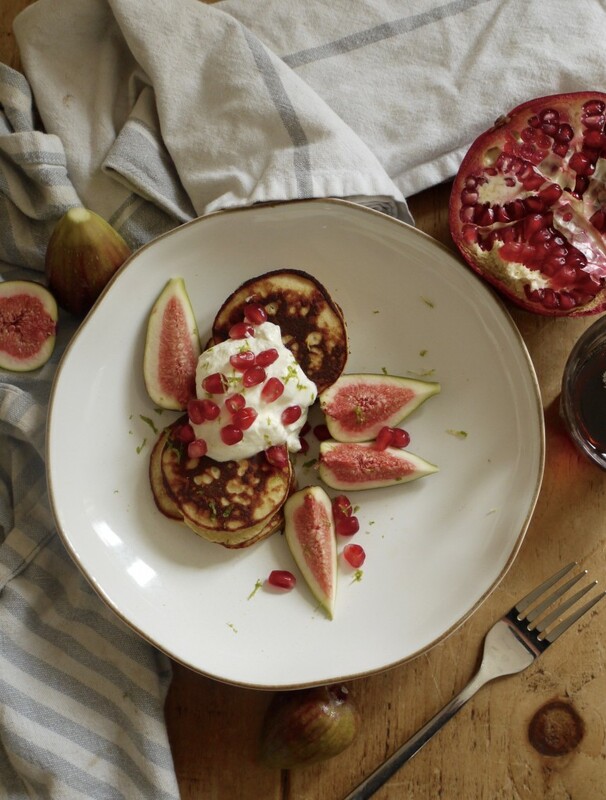 To serve, top stacks of pancakes with a dollop of yoghurt, the fruit, a scrape of lime zest and a drizzle of coconut nectar. Just beautiful. Wishing you all the best. This is so beautiful, Kate. Wishing you all the love and luck in the coming days and weeks. Such a beautiful letter to your boy. Fabulous. Im feeling emotional with your tenderness. It is amazing because i leave with my husband for almost 17 years now and we only got married 4 years ago, lol. Lovely words. Wishing you the best for such an exciting time! Aww.. Lovely. Your little one will be just fine..so don’t worry! Beautifully written Kate. Best of luck for the next few weeks. It’s even better than you think it’ll be when they arrive – promise! 16 weeks in and it’s the best adventure I’ve ever had. Totally agree about feeling like a protective Lioness! Hello Kate, my friend Wendy told me about you this morning, and about your website. I’ve just read your lovely words to your little son. I hope and pray he will recover well from his surgery. My little grandson was born with a heart condition, which was discovered when his mum had an ultrasound scan. Originally, it was thought that he had Hypoplastic Left Heart Syndrome, where the left side of the heart doesn’t grow properly. He was born at the John Radcliffe Hospital in Oxford, and kept in a pre-natal state until he was transferred to Great Ormond Street Hospital a week later for surgery. Thanks to the wonderful surgeons, he survived an aortic arch repair to his heart, which, we were told would have been no bigger than a walnut. His chest was kept open for three days after the surgery, then he had a further procedure. He has regular check-ups with the cardiologist, who is pleased with his progress. He also seems to have a lot of chest infections, but is otherwise a happy little two year old. Sending good wishes to you and your family.